Proud to announce the seasonal release of our craft brew, Narragansett Bock. A silver medal winner at the 2011 World Beer Championship and the recipient of a 95 (World Class) rating from Beer Advocate, Bock will be available on draft and in our signature 16oz tall boy cans now through March. Narragansett Bock is brewed in small batches at North American Brewery in Rochester, N.Y., under the supervision of award-winning brewmaster Sean Larkin from Trinity Brewhouse and Revival Brewing in Providence. The craft offering is brewed with light and dark Munich malts, Pilsner malt, Malted Wheat, and hopped with Northern Brewers and Hallertau hops. A traditional Bavarian helles lager beer, our Bock is deeply flavorful with a rich golden color and full body, offering an extremely approachable craft experience. Despite its full body, the flavor is not overly malty and delivers an elegant spicy character from the hops that produces a balanced, smooth finish. It weighs in at 6.5 percent Alcohol by Volume and 32 IBUs. We’ve been brewing craft beers for more than 100 years, introduced the first ‘Gansett Bock on February 8, 1912, two months before Fenway Park opened its doors for the first time. 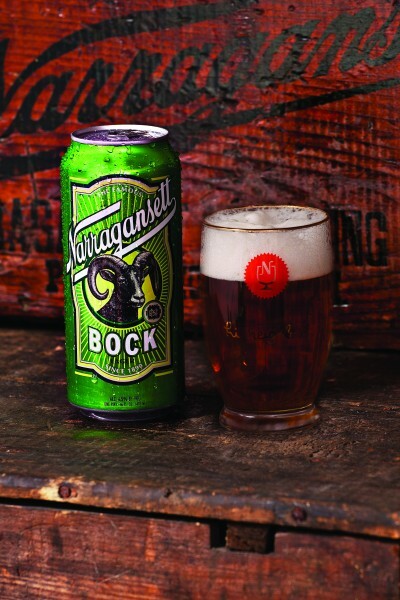 One of New England’s oldest craft beers today, Narragansett Bock quickly rose in popularity after its introduction thanks to the Bock Beer Festivals that were held on the brewery’s grounds every spring. The style originated in the town of Einbeck, Germany and later adopted by Munich brewers. Due to their Bavarian accents, they called the beer “ein-Bock” which translates in English to “billy goat.” They later simply called it just “Bock.” This is why ‘Gansett features the goat on the label. Bocks were often associated with religious occasions such as Easter and Lent and historically consumed by Bavarian monks during times of fasting. This is why it has become a traditional spring beer. Narragansett Bock is available for purchase throughout all of New England, southern and upstate New York, New Jersey, District of Columbia, North Carolina, Pennsylvania, Florida, and Wisconsin. For further information on Narragansett Bock or to find a retailer near you, visit: www.narragansettbeer.com/products/bock.